Finance Minister P Chidambaram has arrived in Washington to deliver a keynote address at the 38th annual leadership summit of the US-India Business Council. 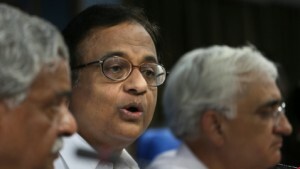 Chidambaram will also be looking to gather support for foreign direct investment (FDI) in India, especially in infrastructure projects, during meetings with industry representatives. The infrastructure sector needs an investment of $1 trillion in the 12th Five Year Plan ending in March 2017. The finance minister will also meet US Treasury Secretary Jack Lew during his visit to the United States. India’s Prime Minister Manmohan Singh recently set up a Cabinet Committee on Investment for the speedy clearance of large infrastructure projects. Some of the key US business leaders Chidambaram will meet include Brad Smith, Microsoft’s General Counsel and Executive Vice President, Legal and Corporate Affairs; Pat Dewar, CEO of Lockheed Martin International and Shephard Hill, President of Boeing International. In May, India’s top court cleared the hurdles for the implementation of FDI in India’s retail sector. An Economic Advisory panel said earlier this year that foreign direct investment in India is expected to increase to $36 billion this fiscal year on the back of supportive policies.